Forget buttons: HTC's new U11 smartphone is squeezy | What Hi-Fi? The U11 deletes a headphone socket in favour of a USB-C port, has a HDR-supported camera and 4GB of RAM. The future of smartphone use may not be buttons. But while Samsung has gone with a bezelless design for its Galaxy S8, HTC has taken a differnet approach: a squeezable phone. The new U11 has "Edge Sense", which means you can squeeze the outside of the phone to perform a customisable function. The examples HTC provides are taking photos (especially in cold weather, as gloves and touchscreens don't mix), opening emails or voice activation. In theory you could use it for anything. Speaking of voice activation, HTC gives you a choice of three digital assistants (in the UK. There are four in China, as the phone comes with Baidu DuerOS as well). You get the conventional Google Assistant you find on Android phones, and Amazon's Alexa software from its Echo speaker (and soon its new Echo Show). HTC also has its own assistant, "HTC Sense Companion" - an effort to break into the AI game as Samsung is trying with Bixby. According to HTC, what sets its assistant apart is that it can "get to know you and your daily patterns over time in order to offer you more convenience every day". Examples of this include reminding you to charge your phone if you have appointments late in the evening, suggesting that you clear junk files and unused apps, letting you know if you need to dress for weather conditions, and recommending nearby restaurants at mealtimes. It sounds impressive on paper - if hardly revolutionary and perhaps a little intrusive - and is undoubtedly a challenge to pull off successfully. Powering the U11's software is a Qualcomm Snapdragon 835 processor, in a version either with 4GB RAM with 64GB of expandable storage or a 6GB RAM with 128GB of expandable storage. On the audio-visual side, the U11 has a 5.5" Quad HD 3D glass screen, apparently able to avoid cropped or distorted pictures. The phone also has "Auto HDR Boost" for its camera, which supposedly offers "clearer, more balanced pictures by taking multiple shots that measure the darkest shadows and brightest highlights without any slowdown". Sonically, the U11's speakers have been ugraded to deliver greater volume and better dynamic range. In the box, the phone comes with HTC USonic headphones: noice-cancelling cans with a USB-C connection. HTC says the headphones map your inner ear using technology similar to sonar, and then adapt the sound profile to your "unique biology". But if you'd prefer to use your own 3.5mm headphones, HTC has supplied an adapter too. 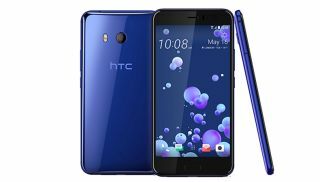 The HTC U11, available for £650 in silver, blue, black, or white, will be available in the UK from June 2017 onwards (with a red version arriving at a later date).